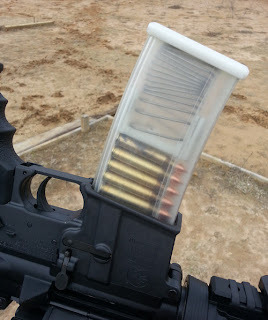 January 17, 2013 (LocalOrg-Tony Cartalucci) - Forbes has recently published an article about New York Congressman Steve Israel's promise to ban 3D printed high capacity ammunition magazines. The congressman's comments come after Defense Distributed, an open source DIY gunsmith group working to manufacture both guns and their accessories using 3D printing technology, successfully printed and tested a 30-round AR-15 magazine. "But for either [Congresswoman Diane] Feinstein or Israel’s bill, the same problem arises: How to enforce that prohibition in every garage and workshop in America that houses a 3D printer?" Of course, without becoming Nazi Germany or Stalin's Soviet Union, or something far worse, there is no way to enforce these gun regulations. Criminals in particular will continue trumping the law, and because of the government's refusal to actually tackle the socioeconomic factors driving violence and its insistence on instead punishing law abiding citizens, their authority, legitimacy, and ability to enforce even sensible legislation will be compromised. And 3D manufacturing isn't the only way to build your own gun. As a matter of fact, around the world where criminals are unable to buy guns, they do indeed already make their own - and then, as criminals are wanton to do, commit crimes with them, including, murder. 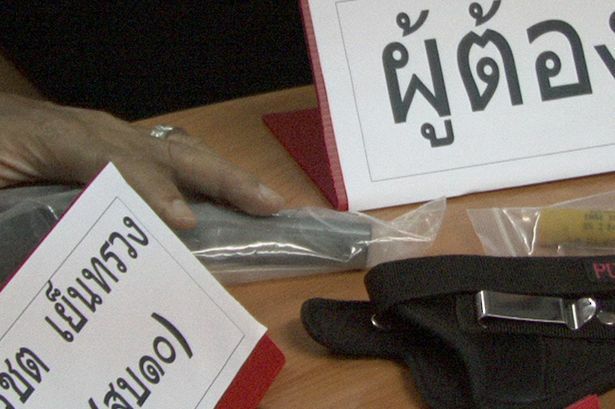 Image: This homemade handgun was made by an unruly Thai party-goer who claimed the life of a British tourist this New Year's Eve. Despite the ubiquitous nature of guns, both homemade and manufactured in Thailand, and nearly no means of enforcing whatever legislation may or may not be on the books, gun violence (and violence overall) is still less than in the United States. In Thailand, vocational schools are plagued by fierce gang-style rivalries. With standard tools, these students construct homemade guns which they frequently murder each other with. And just this New Year's Eve, a British tourist was killed when a fight broke out at a party, and a homemade gun was fired. The difference between a Thai vocational education, and say a German or Japanese vocational education is one of culture and socioeconomics - not access to tools. Preventing people from manufacturing guns, or worse yet, from possessing or using tools that can be used to create guns, is both ludicrous and impossible. Like with cars or anything else, laws are there to ensure we don't harm others by abusing any given right or implement - not preventing us from having those rights or implements responsibly in the first place. In the end, one must address the factors in any given society that drive large numbers of people to commit violent crimes in the first place - regardless of their chosen means or method. In reality, an honest public representative would already be far too busy improving education, infrastructure, and the economic prospects of their people to waste time on banning every conceivable implement that could be used in a crime, directly or indirectly. The goal of Congress members like Feinstein or Israel, is not to prevent violence - but to simply disarm the population as the corporate-financier interests they represent seek to be further unhindered as they loot people and nations both abroad and at home. The fact that the White House is taking such bold actions against "guns," citing "mass shootings" which account for a fraction of 1% of all homicides, indicates a far more insidious agenda - and one based not on real priorities, but built upon a carefully exploited, emotional campaign to exact an obvious but not forthcoming final goal. Defense Distributed has a website - DefCAD.org - and the files for building their various designs available for downloading and use - for free. The files are in .IGS format and require a computer aided design program (CAD) to view them. 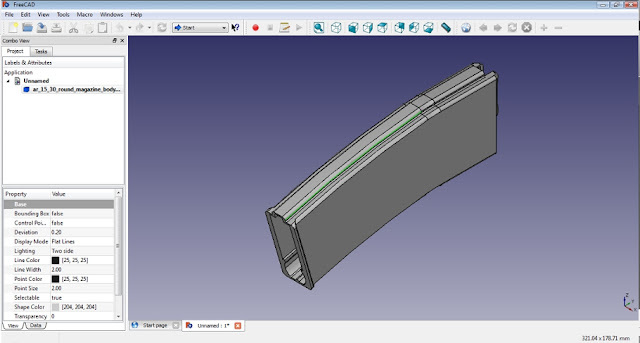 FreeCAD is an open source, free to download program that works well. This is where, again, a local hackerspace pooling people's resources together would help infinitely, especially when most hackerspaces come equipped with 3D printers and people capable of operating them and more importantly, capable of teaching you how to use them. Image: Defense Distributed's 30 round magazine opened in FreeCAD. Right now, there seems to be only Defense Distributed pursuing this project in any meaningful manner - which should be a cause of concern for anyone who thinks this is a good idea. One group of people working on this alone is a giant, slow-moving target prone to failure from both within and beyond. Many people working on this in parallel, however, presents the same problem the movie and music industry face with file sharing - impossible victory/inevitable defeat. Starting your own open source "distributed defense" group would be a good way to hedge the risk of having just one group coordinating efforts toward developing open source firearms accessible to all. DefCAD could be infiltrated, co-opted, or derailed in so many conceivable ways considering the implications the work it is doing have, it would be foolish not to hedge such risk. The lack of direct participation in preserving our rights, and instead depending on lobbyists and protesters alone to to do it for us is one problem. Another problem is the purposeful polarization of the "gun debate" - of gun advocates and their critics along predictable political lines. The Washington Post, which is ironically run by a right-wing Neo-Con editorial board, recently celebrated President Obama's "clever" use of the Constitution to turn the gun debate on its head. It also noted gleefully that part of the plan was getting the "people" themselves to demand stricter gun control. This will be done by getting half of America (the left) to take the guns away from the other half (the right). Faux right-wing leaders take particular care in ensuring that to be a "gun rights activist," you must also be a xenophobic crypto-racist, Islamophobic, and a conservative who believes the problem facing the world are closet-Communist liberals. Likewise, the faux left's leadership ensures that their followers believe conservatives, their religion, and their guns are the root of all problems. In reality, the corporate-financiers run both sides of the debate and direct the talking points of prominent personalities on both the faux-left and faux-right. Obviously, instead of digging in and playing along, our goal should be to reach across the aisle and close this artificial divide - by abandoning the leaders claiming to represent our particular political proclivities and working together to address the true causes of violence - social injustice, socioeconomic decay, and inadequate, impractical education. 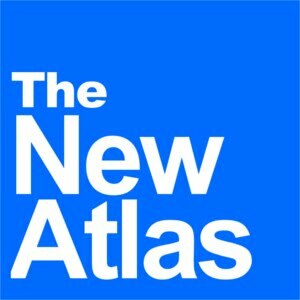 Getting involved includes creating local institutions that find common ground and reject this artificial polarization - common ground that includes improving education, health care, and local economic prospects, which in turn reduces violence and leaves only responsible people with firearms (and the means to make them). Local efforts must be apolitical and all-inclusive - because if we are reduced to talking politics, it is because we don't have a pragmatic solution to solve our problems. DefCAD has a pragmatic solution - leveraging tangible, modern technology to ensure our rights are not trampled upon by insidious politicians. Taking away guns is not an option politically, and soon, not an option practically. All sides who truly seek to reduce the violence in society will be forced to look elsewhere for the solution. Since guns were never the problem to begin with, the advent of 3D printed guns and the insurmountable deterrence they present to "gun control," may be a blessing in disguise for all who seek a more peaceful and just world.